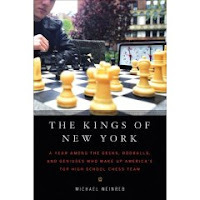 The Kings of New York: A Year Among the Geeks, Oddballs, and Genuises Who Make Up America's Top HighSchool Chess Team by Michael Weinreb should interest all progressive educators and members of the John Dewey society. The Kings is a profile of the national championship winning chess dynasty at Edward R. Murrow High School in Brooklyn, New York. Murrow is a magnet school for gifted kids that provides a lot of protected space for its students to 'do their own thing'. The founding principal, Saul Bruckner, transferred to Murrow from John Dewey High School in Coney Island, a school with a project-based curriculum, where the students did not receive grades. Murrow went even further in the 'progressive school' mode, providing lots of free time by having each class meet only four days a week and looking the other way if kids hung out in the school yard or smoked in the bathroom, or even cut classes for weeks on end. As the principal of this school for its first thirty years, Bruckner became something of a cult figure in New York high school circles. Surprisingly, Diane Ravitch has praised the school, perhaps because of the great achievements of many of its students. The chess coach, Elliot Weiss, had a scouting system for chess talent that makes major league sports look, well, minor league. By placing himself on the board of the organization running chess tournaments in the New York region, he had early notice of promising elementary school kids. And even though competition for admission to Murow was very stiff, Weiss could get these kids into Murrow even if their academic performance through Junior High was terrible. And chess prodigies, obsessed by the game, are notoriously poor school students. An organization called Chess in the Schools (CIS) had funded chess instruction at several New York elementary and middle schools, and one, PS 318, had become a chess dynasty because its instructors were high ranked master players. 318 became, in effect, the farm team for Murrow. Kings chronicles a couple of years in the life of the team members as they pursue their national championships. The players include Russian and Lithuanian immigrants, Puerto Ricans, Haitians, and African-Americans. Each is a kind of troubled genius with a fascinating life story. What stands out is how a considerable number of selfless heros (I do not use this word lightly) including Bruckner, Weiss, the funders of Chess in the Schools, the chess instructors, and a few private benefactors, made this incredible story possible. Even when you add up how much they all had to give in time and effort and money so that a bunch of misfit geniuses could develop their unusual natural gifts, however, you realize that a rich country like this could provide something as wonderful for everyone needing it and capable of gaining from it. If, that is, the entire culture were not so slanted to selfishness and greed and if accountability schemes would stop driving them out and destroying schools like Murrow. The book documents the steady changes in Murrow school brought about by No Child Left Behind, as well as by draconian school security measures imposed by the Bloomburg administration that have eliminated free time, hanging out, and cutting classes.